Monet’s garden tea cosy is quick and easy to knit, this includes making knitted flowers and leaves for decoration. 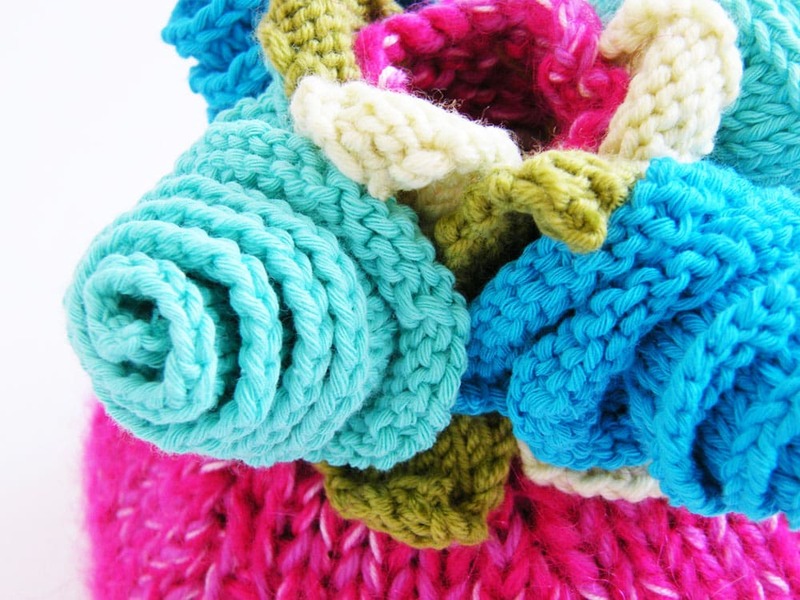 This tea cosy can be made in any colour combinations you can think of, the louder the better! Knit flat in two pieces and then seamed, this cosy is simple in its design and when the flowers and leaves are added it becomes something else. 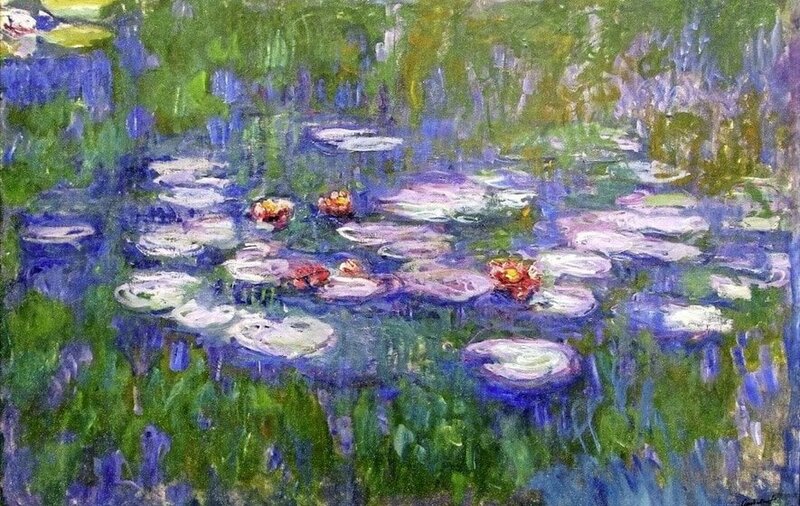 The purple and blue tea cosies in the photographs were largely inspired by a visit to MoMA in New York and the National Gallery in London where I viewed in person the magnificent paintings from Monet’s garden in Giverny. The colours were amazing and I wanted to use them (or some of them) to design a tea cosy pattern. 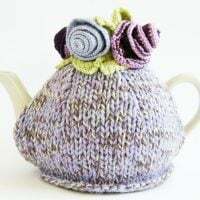 I also made one of these tea cosies in hot pink with bright flowers, as I had some yarn in my stash that was crying out to be used up! The pattern is easy to follow, knit flat on straight needles. 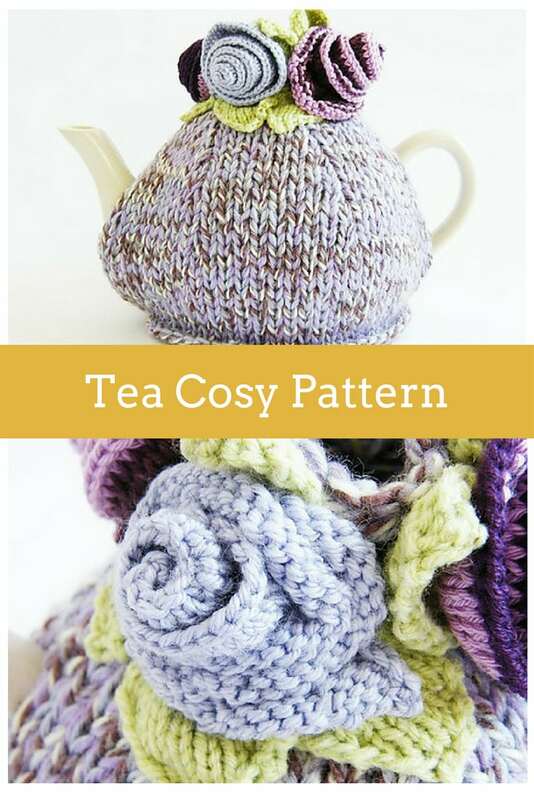 You can use up leftover yarns in your stash and make lots of tea cosies in different colours. 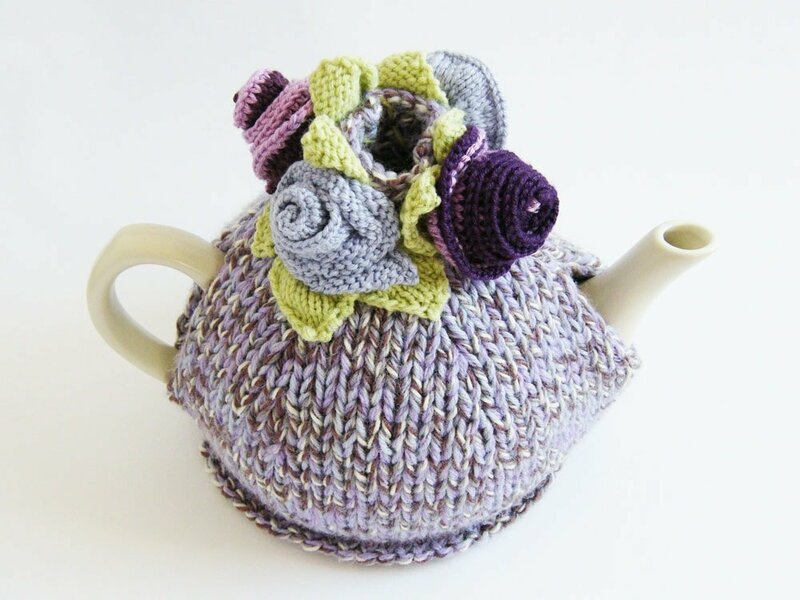 The tea cozy pattern is great for any beginners who are learning how to knit, as it is a great project for learning new stitches. 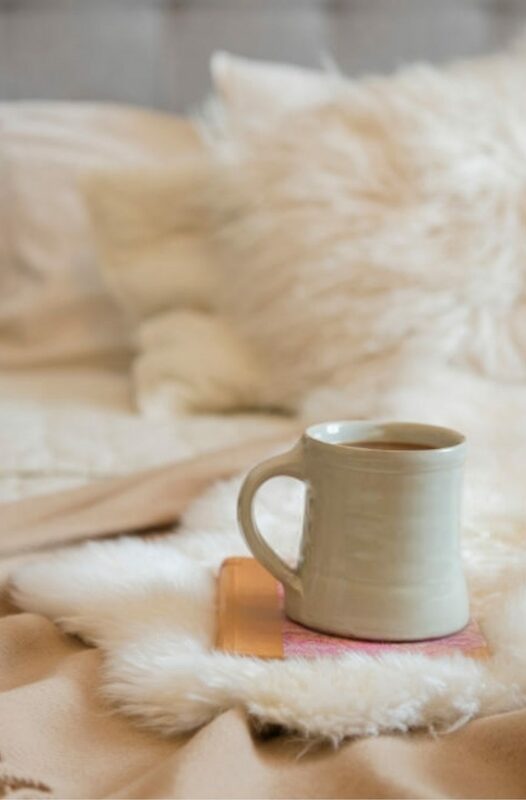 If you would like to make more knitted items for the home, please take a look at the other patterns in the home knitting pattern library. 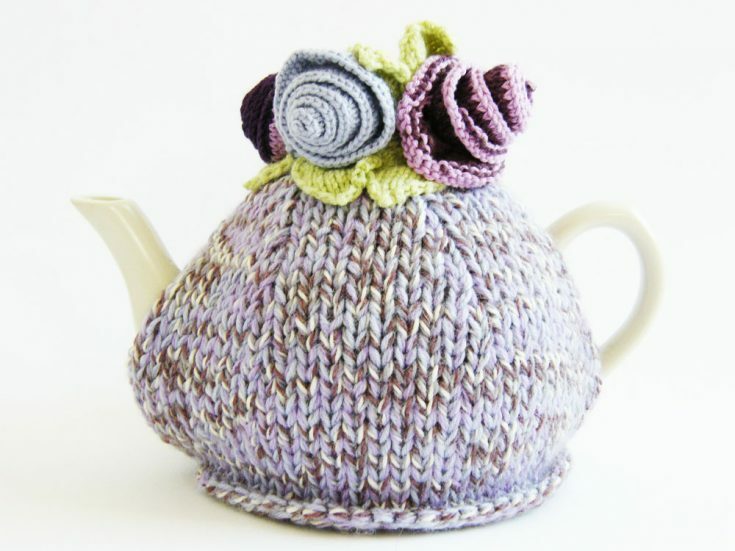 You can also make this knitted tea cosy in other colours – whatever you have in your yarn stash! 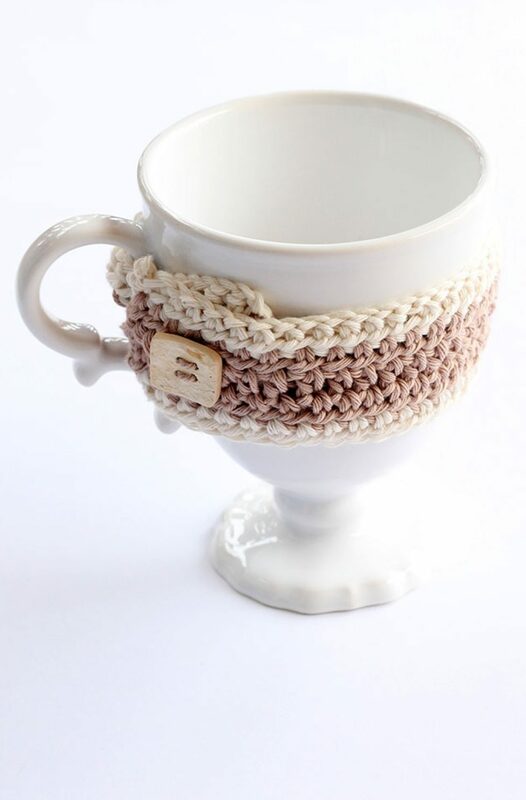 I have made this cozy in a variety of colours, from hot pink to yellow. 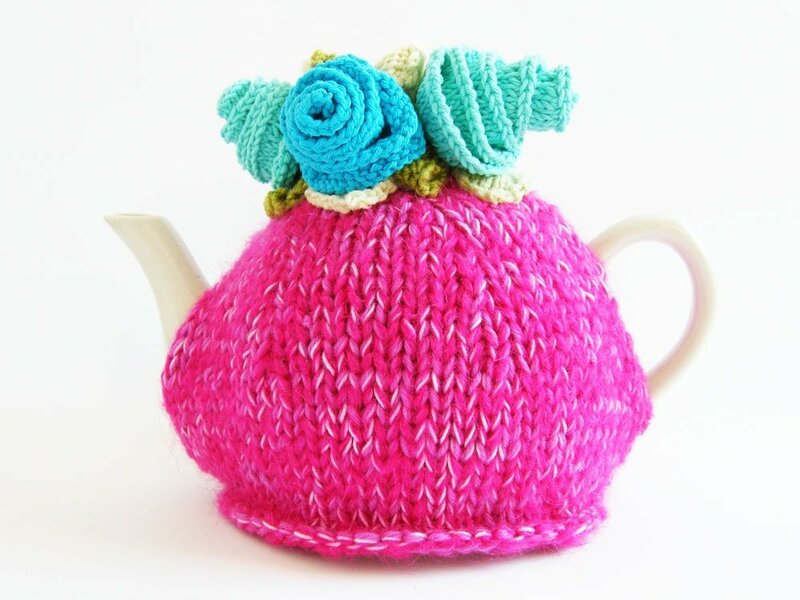 Take a look at the tea cozy below, made in hot pink yarn with bright turquoise flowers, made by using up leftover yarns from my stash. 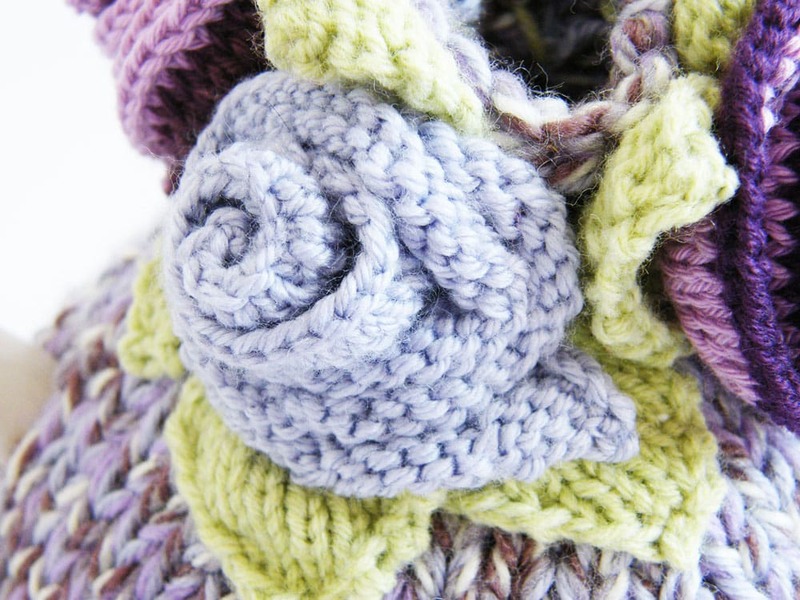 A simple tea cosy which is quick and easy to knit, this includes making knitted flowers and leaves for decoration. Using 5.5mm (US 9) needles and your yarn choice cast on 31sts. Work in st st for 12 rows. Work the two fronts following the same pattern. Sew each front together at the top and bottom of the sides leaving holes for the spout and the handle. Row 2: Increase knit wise into each stitch. Row 4: *K1, increase into next stitch*, repeat * to * to end. Row 6: *K2, increase into next stitch*, repeat *to* to end. Row 8: *K3, increase into next stitch*, repeat *to* to end. 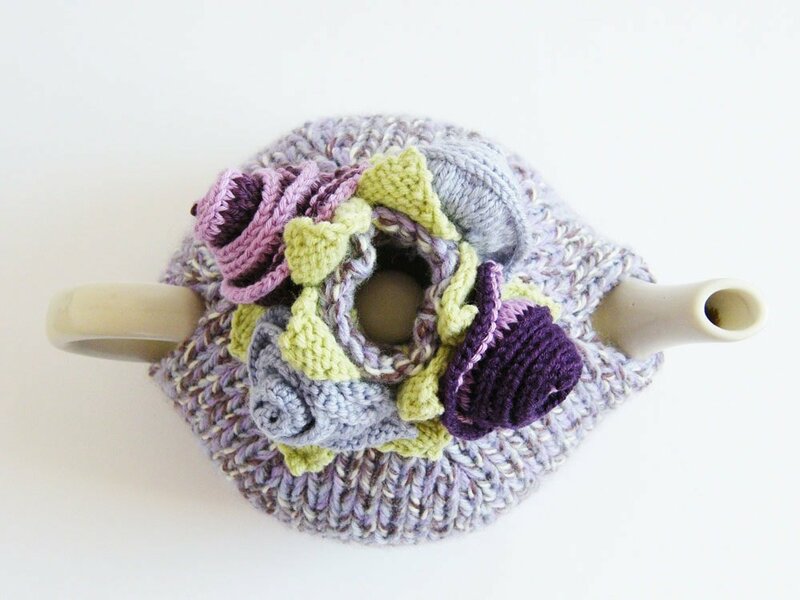 Curl your flower inwards and secure by stitching loose cast off end through the bottom. Leave a tail, long enough to sew onto the top of the tea cosy. 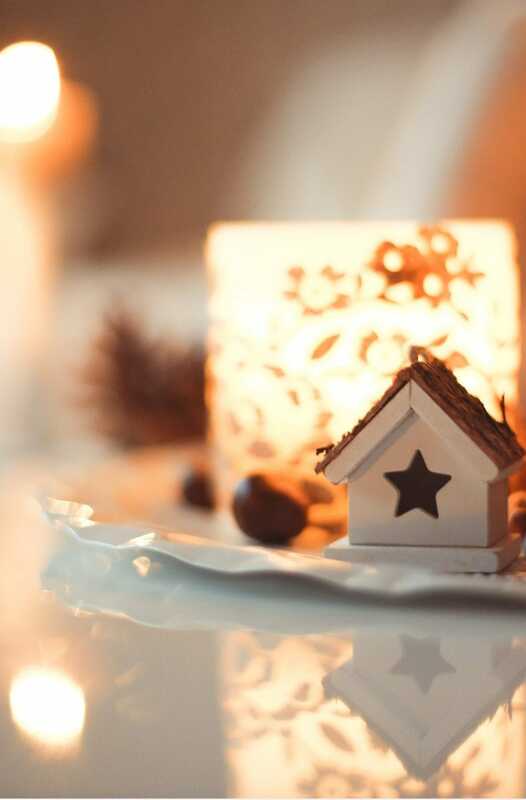 Make 6 or however many you want to decorate. Stitch the flowers and the leaves into place around the top funnel of the tea cosy. Arrange the flowers how you want them to look and secure into place. SKPO – slip one stitch, knit one stitch, pass slipped stitch over knit stitch. If you enjoyed making the tea cosy, I’d love to see yours on Instagram, be sure to tag me @handylittleme.